Paris – every season, the city of fashion has the privilege to say goodbye to the fashion month for another half a year. The past Paris Fashion Week days were exciting with quite a few ups and downs. Young upcoming designers presented their new collections to the public, while the fashion world had to say goodbye to one of the greatest legends, Karl Lagerfeld. But as the circle of life, every farewell also holds a fresh start and therefore, we are curious how the fashion world will evolve in the upcoming months. 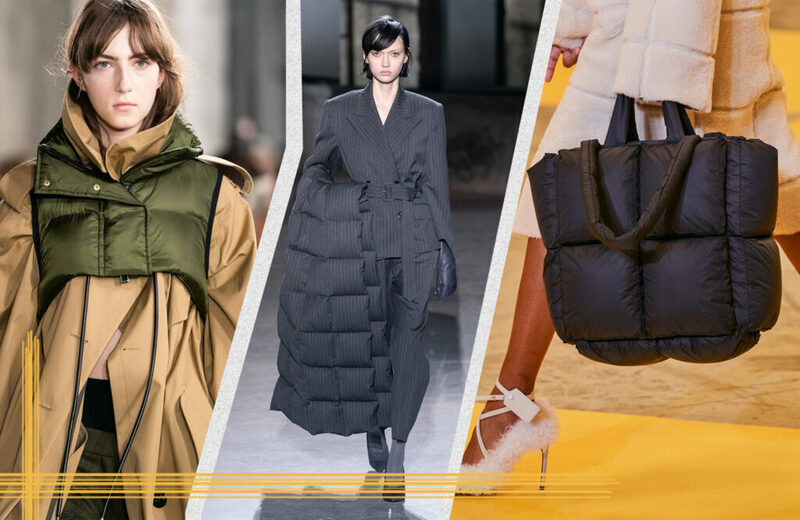 But first of all, let's take a look at the four big trends from Paris Fashion Week fall/winter 2019/20. It is a textile technology with a long tradition that roots back to the ancient Orient. 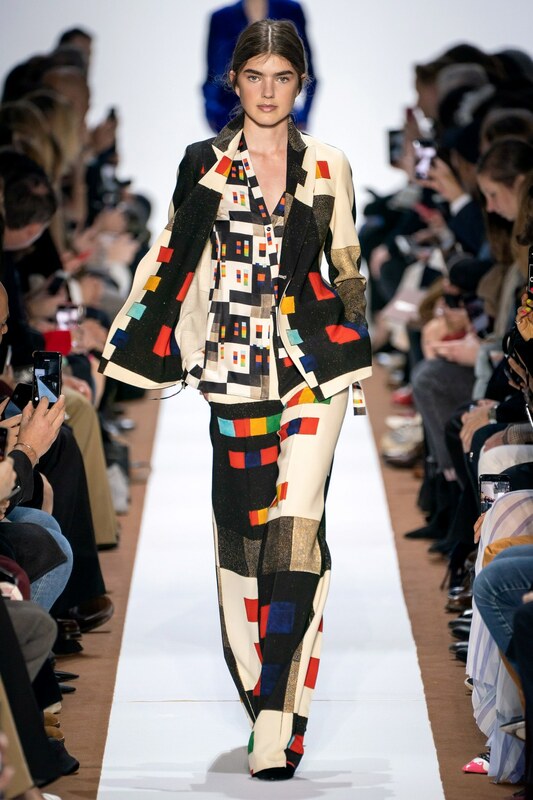 In patchwork, different pieces of fabric are sewed together. The technique was particularly popular during the world Great Depression after the Golden 20s. Back then, it was a cheap possibility to make new fabrics out of old textiles people already had. So maybe, you remember the style from patchwork blankets from your grandparents. The technique, of course, still works today. Why choose a material or pattern, if there are so many amazing versions anyway? That's probably what the designers of this year's Paris Fashion Week thought as well. After patchworked denim has been big for this season, the designers took the game even one step further for fall/winter 2019/20. 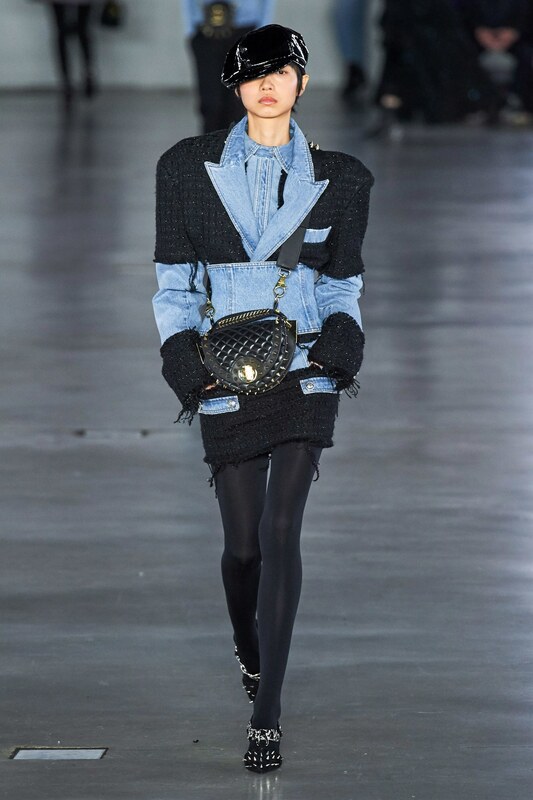 At Balmain, a denim jacket with wide shoulders and sleeves was decorated with patches of tweed. 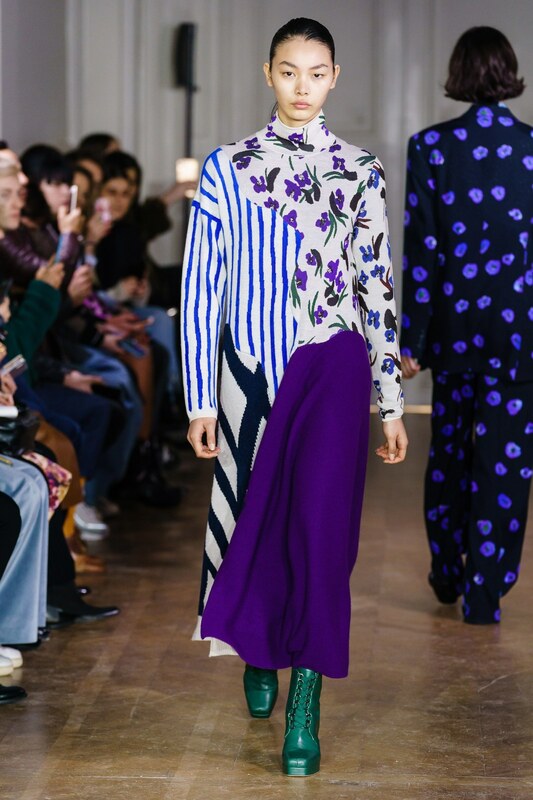 Furthermore, fashion designer Christian Wijnants presented a fine dress that combined stripes and floral patterns in a very harmonious way. 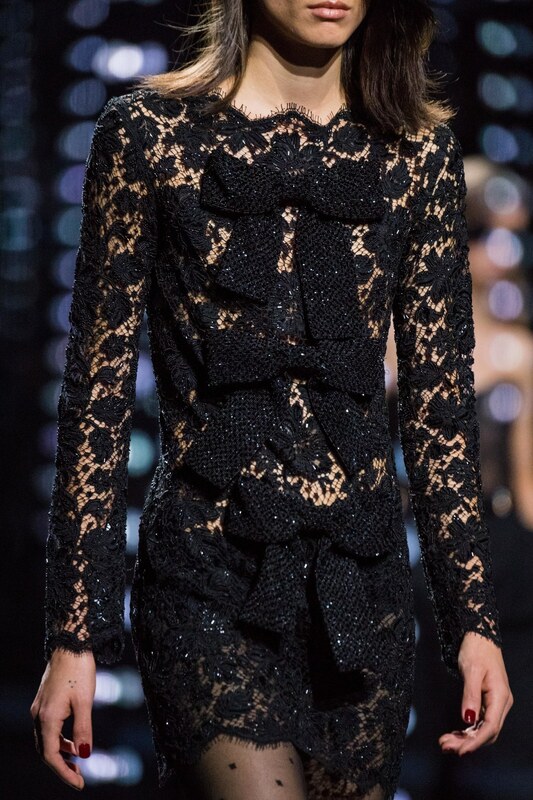 At Elie Saab, cut-outs made out of transparent black tulle formed the exciting contrast to the sequined patches. 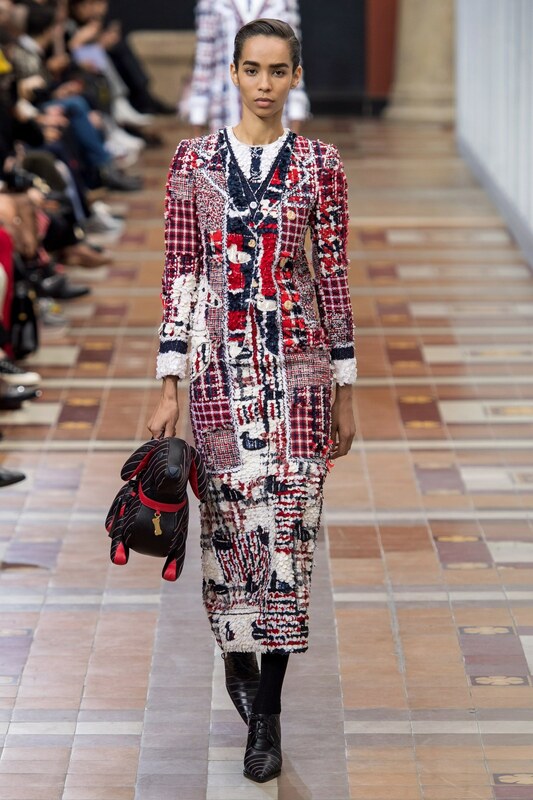 The New York based designer Thom Browne showed us a classic version of the patchwork trend in the colors of France: red, white and blue. Of course, layering clothes is not a new trend, since it has evolved out of the protection against the cold. 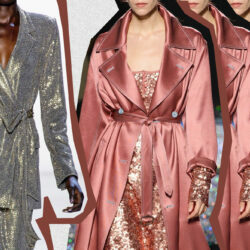 Nevertheless, we saw a special layering trend at this season’s Paris Fashion Week. Actually, it consists of two parts only: a pair of trousers and a dress. Joseph Altuzarra dedicated his collection to the feeling of freedom, which he experienced during his last trip to Morocco. He combined a green dress with patterned wide-cut pants and sandals. To give the look a glamorous finish that makes you think you are strolling through Medina, the look was shown with delicate golden accessories. At Beautiful People, we saw a simple outfit of pleated trousers and a turtleneck sweater. Again, the exciting part was the plaid dress worn over the rest of the look. 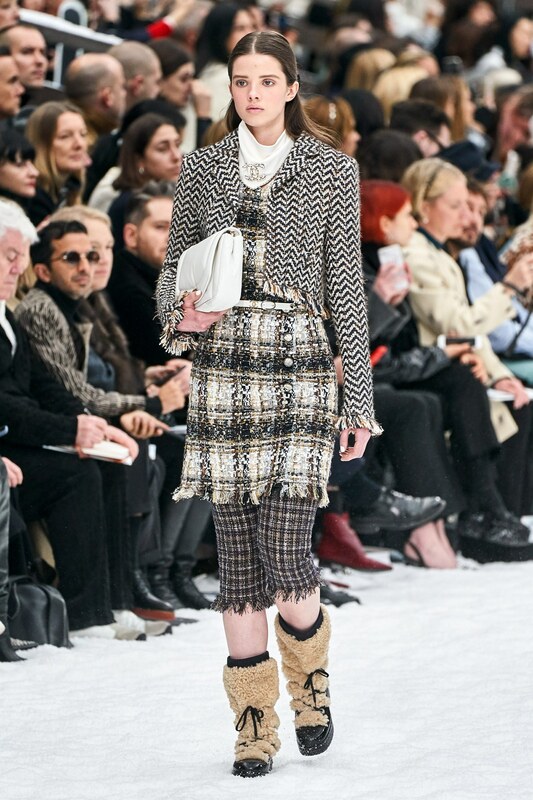 And one last time, Karl Lagerfeld enchanted us with his collection for Chanel, in which he also incorporated a tweed look consisting of a mini dress and three-quarter pants. 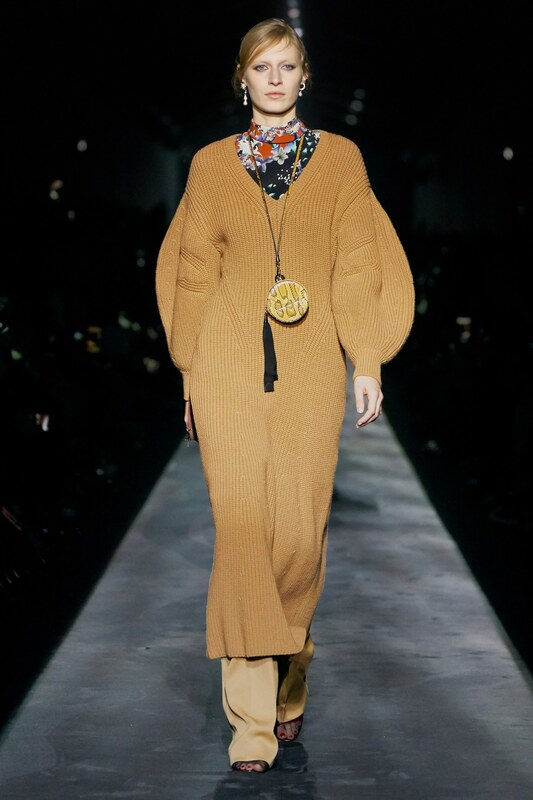 At Givenchy, creative director Clare Waight Keller presented the trend as a combination of a knitted maxi dress and a pair trousers colored autumnal tones. 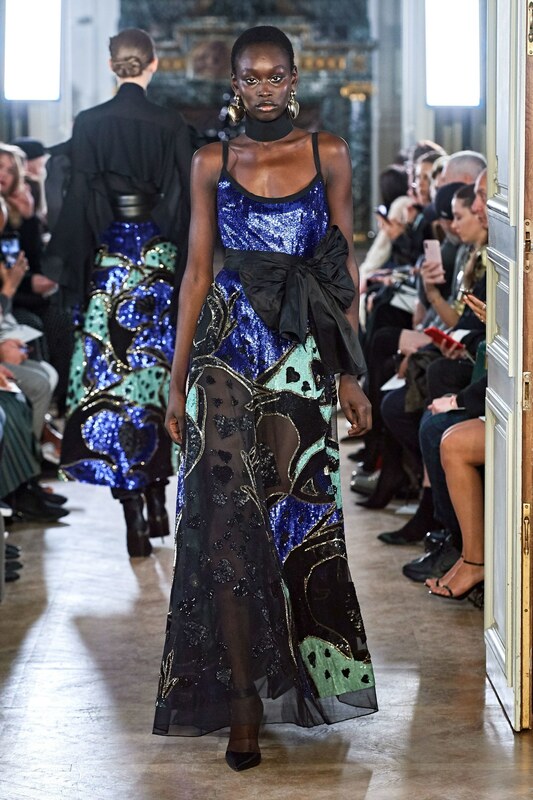 The designer duo Talbot Runhof even showed a pair of sequin trousers with a shimmering purple dress. 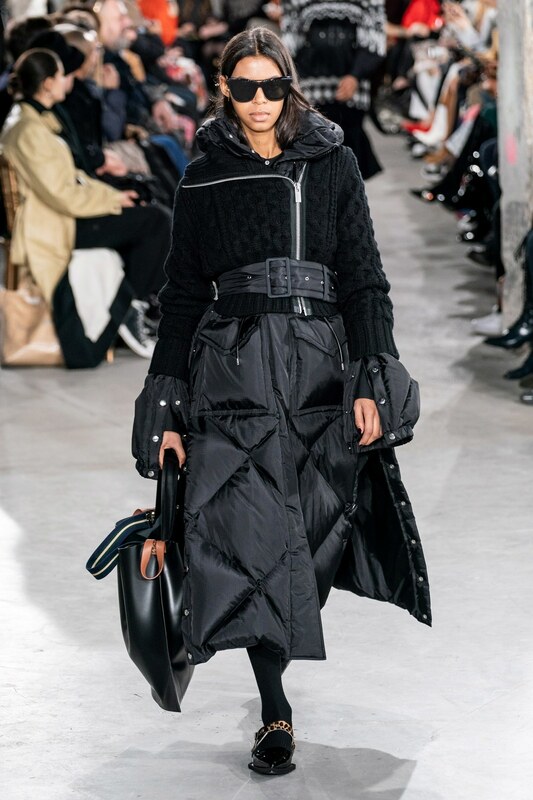 Whether short and puffy or long and slim – puffer jackets have kept us warm in all kind of versions this winter. So good news for all lovers: the (imitated) down material will stay with us for the next fall/winter season, but not necessarily as a jacket. 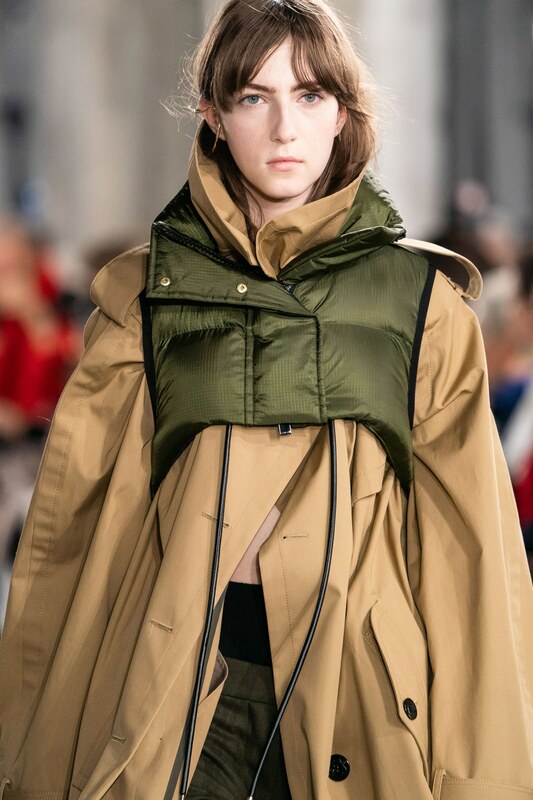 The Paris Fashion Week designers showed us amazing experiments in their collections. 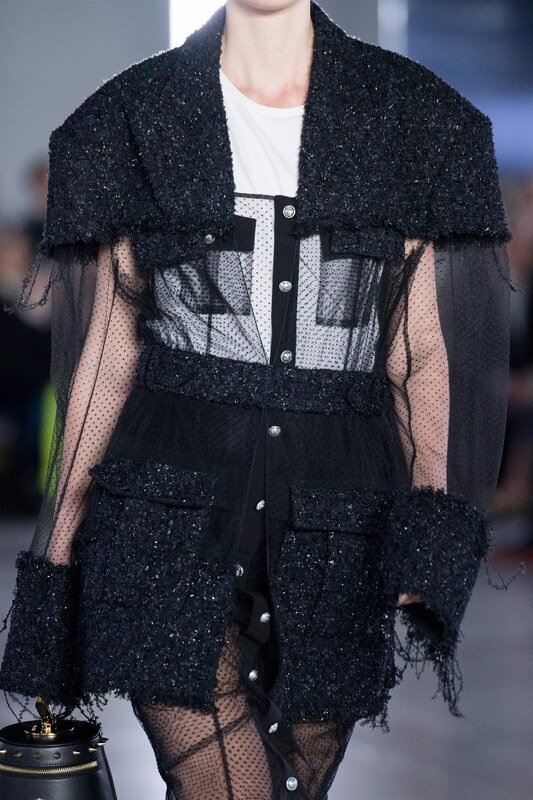 For example, as an all-over look at Givenchy. 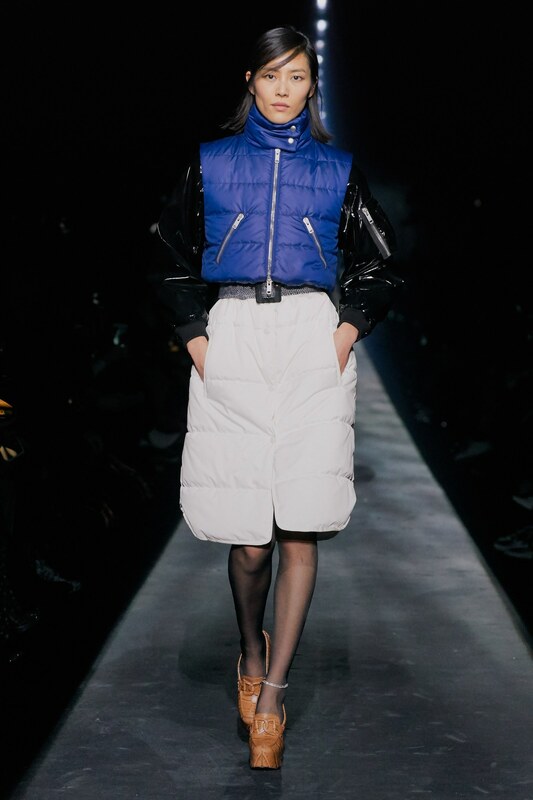 The white skirt and blue jacket gave the whole look a sporty athleisure touch. 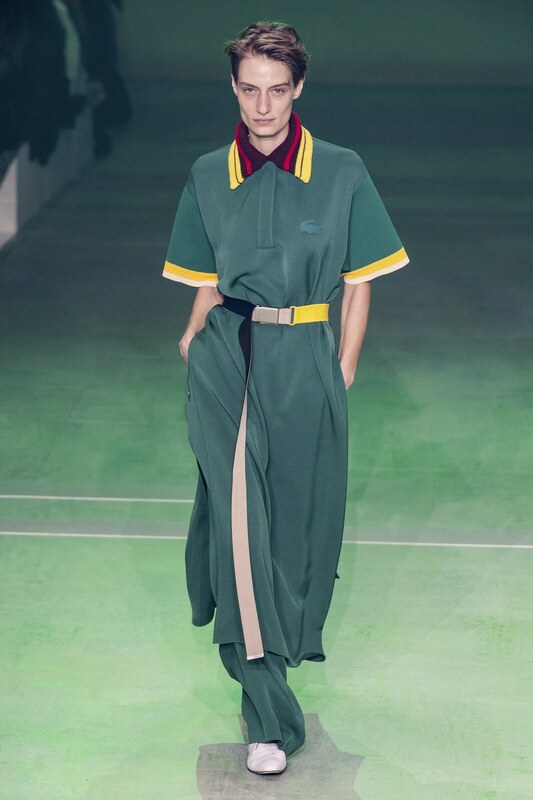 Sacai featured a sort of a down dress in a combination with a black cardigan. In general, the fashion brand dedicated a huge part of the collection to down details. The trend also applied to accessories. 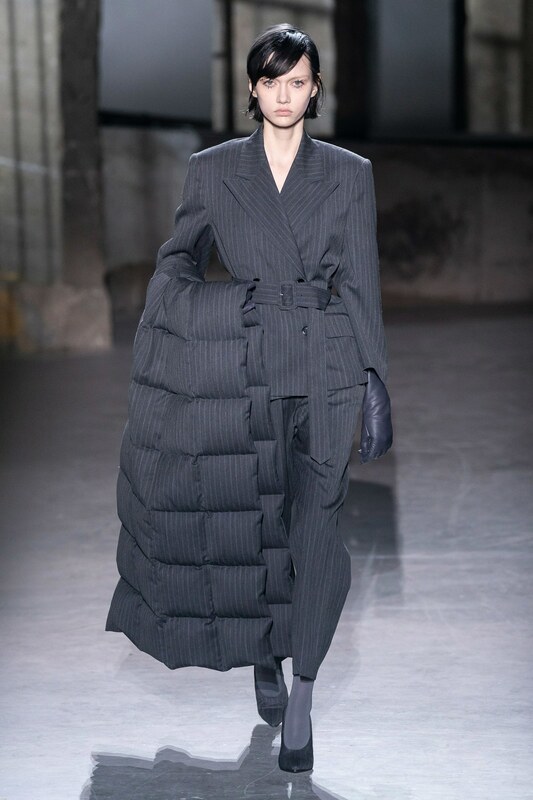 At Dries van Noten, one model wore a huge down scarf and the American designer Rick Owens simply wrapped the long scarf around the model’s waist. 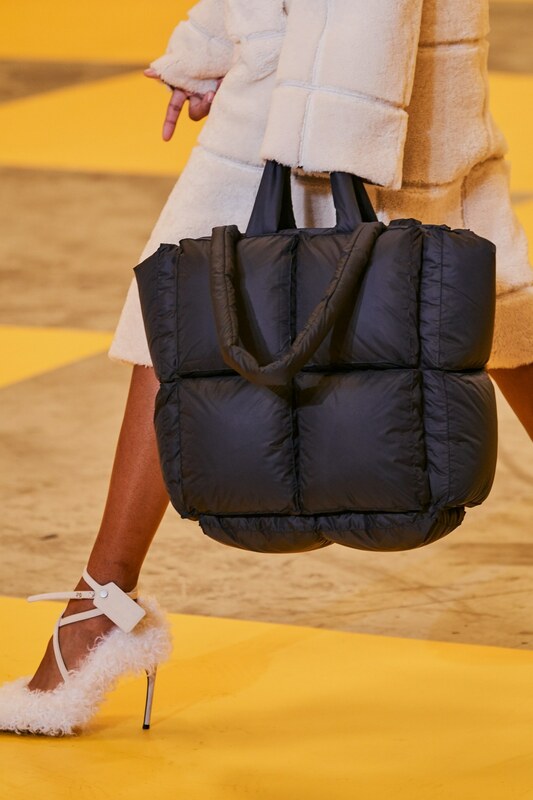 For the bag version, Virgil Abloh will have you covered: he designed fluffy XXL-bags made out of down for his label Off-White. There are materials that will never go out of style. Like lace for example. In white, it will always adorn the most beautiful wedding gowns and lingerie or delicate blouses from black lace have long been indispensable. Often, the lace details are the ones to make a garment look especially elegant. So, the designers from Paris Fashion Week were even one step ahead and covered their models in transparent black lace dreams from head to toe. At Elie Saab, the lace sequined evening dress was one of the show’s highlight pieces. The feminine dress was combined with a black blazer for an eye-catching, androgyne contrast. The Swiss label Akris was even a bit braver. The only coverage was ensured by a tiny black skirt. The rest of the body was covered with a fine layer of black lace only – but we all need some sexiness in the city of love, don’t we? 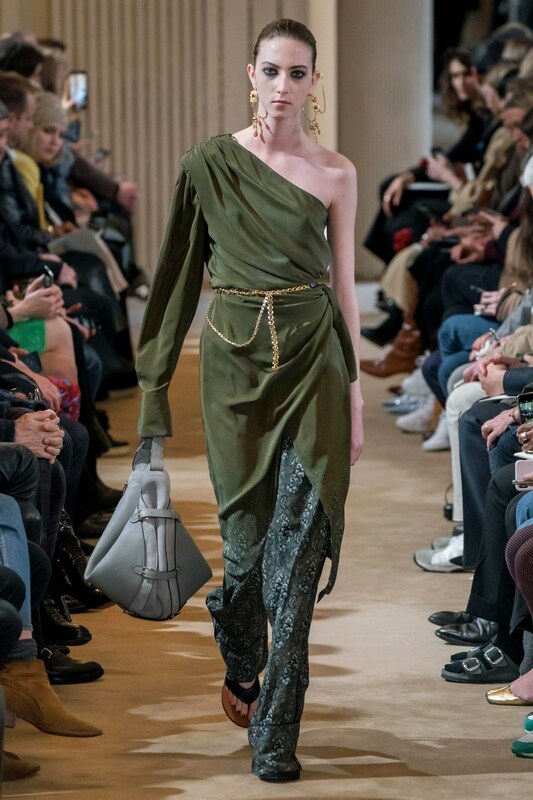 Olivier Theyskens followed kind of the same idea with a transparent dress and black over-the-knee boots. Sarah Burton, creative director of Alexander McQueen however, remained true to her style. A bit of punk, a bit of gothic et voilà – the result was an impressive dress with a lace corsage, as every goth bride surely would love to wear at her wedding. 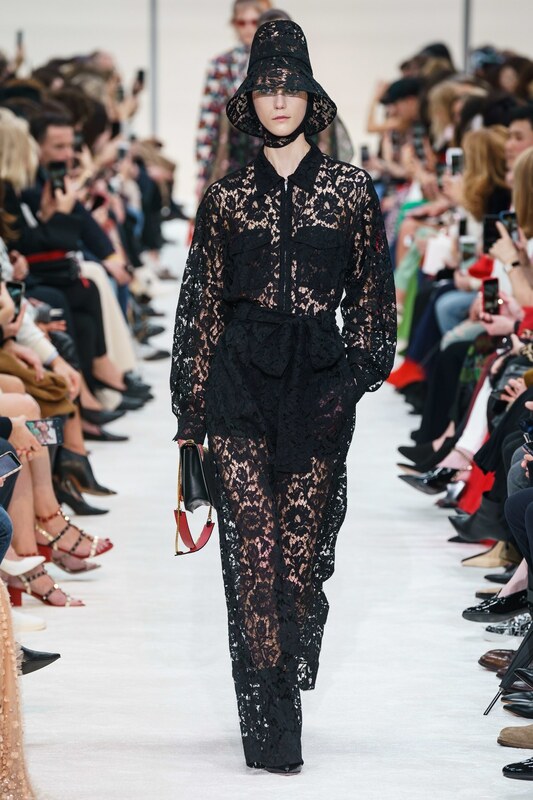 At Valentino, a complete look made out of black lace completed the romantic mood of the collection. Besides to the blouse and pants combo, Creative Director Pierpaolo Piccioli also designed a hat made out of the same material. So yes, black lace is definitely a trend for everyone! 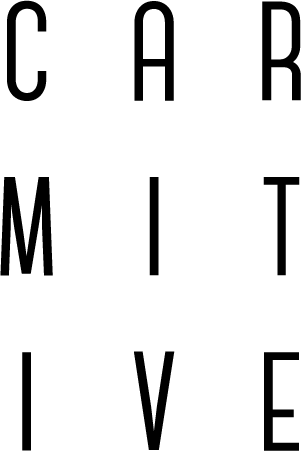 See more Fashion Week updates on Instagram @carmitive in the "Trend Update" stories highlight. 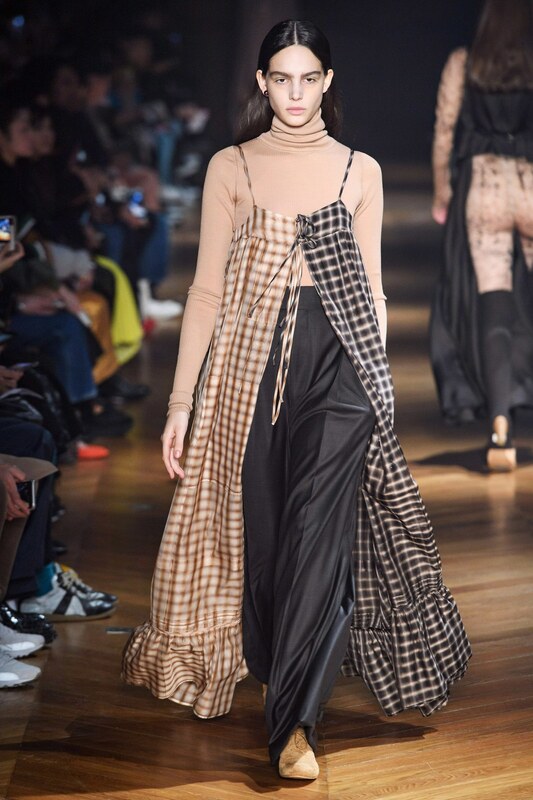 Posted in News and tagged Fashion, FW19/20, Fall Winter 2019/20, Inspiration, Runway, Lifestyle, Musthaves, Outfit, Paris, Paris Fashion Week, PFW, Things to love, Tips, Trend. Bookmark the permalink.